Shipping Information: Your shipping charges will include a base charge of $3.00 per order and $2.00 per root. We ship USPS priority mail. 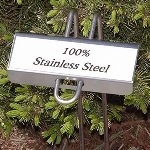 Laminated label for garden stakes. Legible year after year.